Import of goods? mind noise! 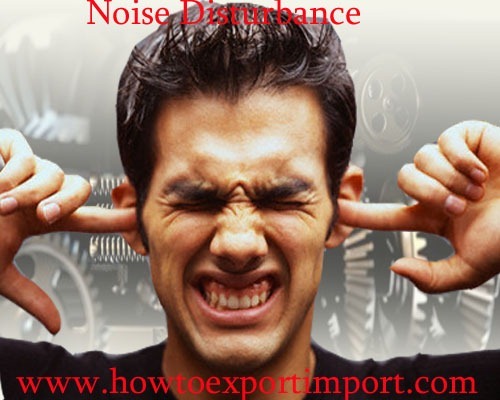 Reasons for noise protection when importing. As mentioned in other articles in this web blog, the import of any materials should not adversely affect human, animal and in turn environment of earth. So control of noise arising out of any imported material directly or indirectly is a dire need. How does noise effect environment? Noise can effect on wild animals, increasing the risk of death by changing the balance in predator or prey detection and avoidance, and interfering the use of the sounds in communication. Acoustic overexposure can lead to temporary or permanent loss of hearing. An impact of noise on wild animal life could lead to an impact reduction of usable habitat that cause endangered species may be part of the path to extinction. Noise pollution may have caused the death of certain species of whales that beached themselves after being exposed to the loud sound of military sonar. Noise also makes species communicate more loudly, which is called Lombard vocal response. These unheard voices might be warnings, finding of prey, or preparations of net-bubbling. When one species begins speaking more loudly, it will mask other species' voice, causing the whole ecosystem eventually to speak more loudly. The major sources of noise pollutions are commercial and industrial activities, transportation, household sources and social events. The immediate and acute effect of noise pollution to humans, over a period of time, is impairment of hearing. Prolonged exposure to impulsive noise to a person will damage their eardrum noise and nuisance Effects on general health include anxiety and stress reaction and in extreme cases fright. The physiological manifestations are headaches, irritability and nervousness, feeling of fatigue and decreases work efficiency. A brief description about the subject is explained here. You may contact concerned government agency for latest update. I hope, the above information about noise enlighten you about a basic idea about the importance. You can share below your thoughts about maintenance of noise standard when importing any machinery, parts or other materials related to the same. Is Seaway bill a document of title? What is Seaway bill. What does ECGC do on default of payment of any overseas buyer? Packing of export goods - How important in International business? What happens, if Bank not received money from buyer after discounting of export bills? What happens, once Bill of Entry for Imports files? What is ATA carnet and how ATA carnet works? What is BVQI inspection on export goods? What is charter party bill of lading ? What is CIF terms of delivery in Exports and Imports? What is DDP terms in an export Import Business? What is DTA in export import trade? What is ECGC and how does ECGC protect exporters? What is EPCG How EPCG works in Export Import trade?